The 2014 National Electrical Code uses several terms for bonding jumpers. A main bonding jumper is found at the service equipment or “Main”. A system bonding jumper can be found at a separately derived system. A good example of a system bonding jumper is the connection between the XO terminal and ground inside of a transformer. An equipment bonding jumper is used for bonding equipment and a supply-side bonding jumper is used for bonding equipment on the supply side of the service. The complete definition of these terms can be found in Article 100 of the N.E.C., with the exception of supply side bonding jumper, which can be found in section 250.2. There are many rules that must be followed to properly size bonding jumpers but in this blog, we will focus on the requirements for sizing equipment bonding jumpers required for raceways enclosing grounding electrode conductors. When a grounding electrode conductor is installed in a ferrous metal raceway, the N.E.C. requires each end of the raceway be bonding to the enclosed grounding electrode conductor or the grounding electrode if the raceway is not electrically continuous. Section 250.64(E) reads: “Ferrous metal raceways and enclosures for grounding electrode conductors shall be electrical continuous from the point of attachment to cabinets or equipment to the grounding electrode and shall be securely fastened to the ground clamp or fitting. Ferrous metal raceways and enclosures shall be bonded at each end of the raceway or enclosure to the grounding electrode or grounding electrode conductor. Nonferrous metal raceways and enclosures shall not be required to be electrically continuous.” The word ferrous is derived from Latin and basically means containing iron. This rule for bonding raceways enclosing grounding electrode conductors only applies to raceways that contain iron and will eventually rust. Rigid metal conduit, EMT, and IMC are typically made of ferrous metals. Aluminum, stainless steel, and PVC conduits are not and thus would not be required to be bonded. 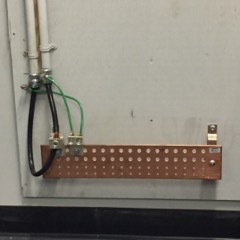 In the attached photo, you can find a typical installation for a grounding electrode conductor installed in EMT. This is a ferrous metal raceway that does require bonding at each end because the raceway is not continuous to the grounding electrode. The installer in this case used a 6 AWG copper conductor to bond the raceway that encloses a 3/0 AWG copper grounding electrode conductor. In section 250.64(E)(3) of the 2014 N.E.C. the code states that the bonding jumper for a grounding electrode conductor raceway or cable armor shall be the same size as, or larger than, the enclosed grounding electrode conductor. This is a code violation and a bonding jumper sized 3/0 AWG or larger should have been used. Many times the lugs are for bonding bushings are too small for the appropriate size conductor. Be sure to find the correct part for the application. Many styles of grounding bushings are available to make the installation easy. Proper grounding and bonding are vital to a safe electrical system. Be sure to check back here often for updated blogs and illustrations to help keep you on top of the electrical field. classes4contractors.com has electrical training courses, electrical exam preparation classes, free electrical practice exams, live seminars, private classes, and electrical practice questions to help you learn more about the National Electrical Code or prepare you for your upcoming electrical exam. We also offer on-line continuing education courses for Texas electricians as well as live CE classes for Ohio, Alabama, North Carolina, and other states. Our instructors have decades of experience and are licensed electrical contractors and master electricians. We also offer live instruction and private classes. Spend some time browsing our site and please email any suggestions or questions to classes4contractors@gmail.com. Send us a picture of a code violation or a proper installation and if we use it in an article, we will send you a great prize. If you don’t know refer to the code book. I was asked to size this service main bonding jumper with 12 sets of 750 kcmils and came up with 1125 kcmils bonding jumper(1250 kcmils next standard size). When I presented my findings everyone said it didn’t have to be larger then a 750 kcmils but that’s not the way I read 250.102(c). Can someone please clarify?